Agua de Alfalfa | tsp. Somehow it is possible in Las Vegas to miss both Oregon and Texas simultaneously. This is because San Antonio and Portland are two of the greenest cities I have lived in– and I literally mean the color green. As in trees. And things growing out of the ground. Things not anchored by macadam. Although San Antonio has its share of suburban pavement– my little section of it is known for its crumbling side walks made hazardous by the wrangling roots of old pecan trees, invasive flowering vines, old cedars towering over the tiny but lush river that flows out of downtown. And Oregon, well, they can grow anything in Oregon. I mean, it’s ridiculous. So here I am trying to get by in this impressively hot weather made even hotter by the neverending pavement underneath me and all around me. You can feel it emmanating up from the ground if you go outside late at night. It’s been 116 the last couple days. So much for “the meadow” that was once here. Hopefully the weather will keep me indoors, getting through the back log of recipes I have for you. I am such a terrible blogger these days. On a positive note, we have found a nearby spot that serves Oaxacan food (something Vegas does have– plenty of variety when it comes to Mexican food), and really good aguas frescas, with the metal vats submerged in an ice cream freezer. Not the honeycomb shaped jars on the counter that arms have to reach into to serve from (like the ones at HEB I will never try.) 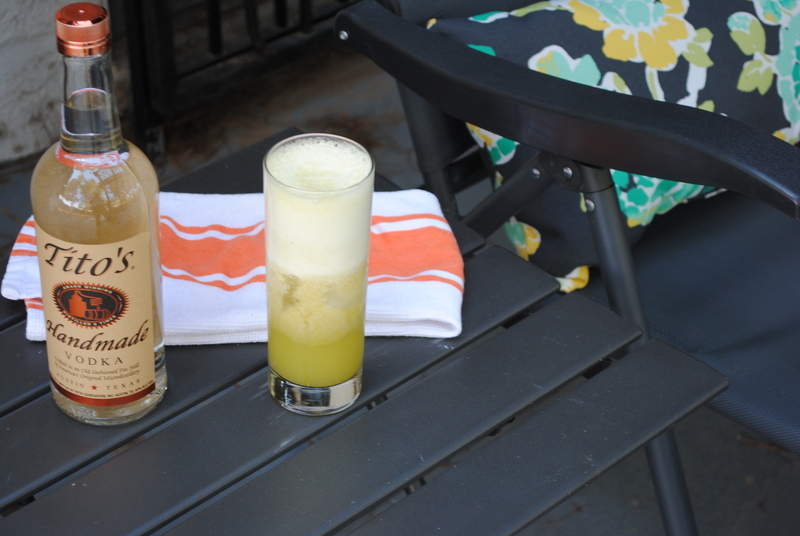 We tried a bright green flavor, and now it is my go-to summer drink. Agua de Alfalfa. If you haven’t tried aguas frescas, you should know that the best ones are not sweet like kool-aid, and much more refreshing than juice. Essentially this is water with a little juice, fruit (and in this case, alfalfa) chopped up and steeped in it for flavor, and some sugar. But they are easily made as sweet as you like if you make them at home, with sugar or with stevia, as I have done. Drinking sprouts is really good for you: Alfalfa is high in protein, calcium, plus other minerals, vitamins in the B group, vitamin C, vitamin D, vitamin E, and vitamin K. By the way, this makes a great drink mix. 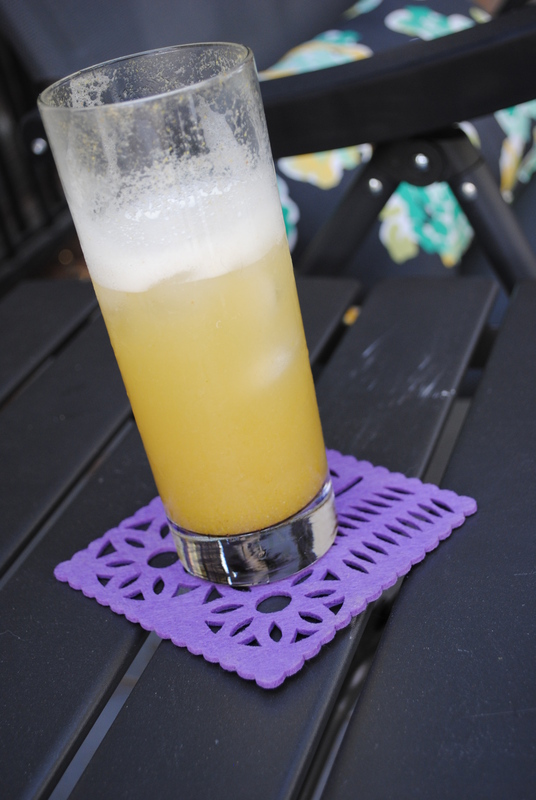 In fact, agua de alfalfa reminded me a lot of a delicious Pim’s Cup I had at a speakeasy in San Antonio. So if you like cucumber drinks, you might like this with splash of vodka. And if you are hungry, try my green chorizo with your green agua. I am beginning to sound like Dr. Suess. Pour the water into a blender, and add the agave and stevia. Then add all the other ingredients. Blend on high until foamy and all the sprouts are pureed.